A native of Barrington, Illinois, Anna Steltenpohl is a graduate of the Curtis Institute of Music and The Juilliard School in oboe and English horn performance. Her teachers have included Elaine Douvas, Pedro Diaz, Nathan Hughes, Richard Woodhams, and Jonathan Fischer. A member of the Rochester Philharmonic Orchestra since 2008, Anna has also performed with such ensembles as the Orpheus Chamber Orchestra, Philadelphia Orchestra, and Atlanta Symphony Orchestra. Anna made her concerto debut with the Rochester Philharmonic Orchestra in March of 2013 playing Vincent Persichetti’s Concerto for English horn and Orchestra. 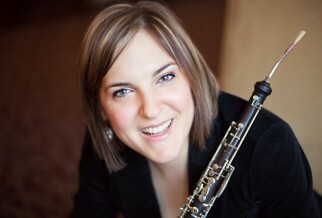 She has performed as principal oboe with the New York City Ballet Orchestra, Honolulu Symphony, and New Jersey Symphony and has attended the Pacific Music Festival and the Aspen Music Festival and School. In addition to being featured on National Public Radio’s nationally syndicated “From the Top,” she and her twin sister Lisa – Principal Violist of the Baltimore Symphony Orchestra – starred in the educational video series “Musical Encounters” and on Philadelphia television. An avid runner and fitness enthusiast, Anna divides her time between Rochester and Omaha, Nebraska, where her husband Bipul is a cardiovascular disease fellow. They share two cats, Poco and Otis.